Shoso created special displays and centrepieces for a cooperate dinner show. We have received very positive feedback from the client. Thank you many assistants for your help. "The arrangements looked absolutely spectacular and the client was delighted with all of your amazing work. Thank you again, it was a pleasure working with you and I look forward to doing so again." 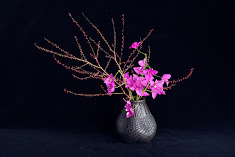 "Thank you very much for the wonderful arrangements you created for the Sakura dinner. The night was a wonderful success, and our client and Japanese delegates were really very impressed. Everything came together really, and we are very appreciative of the hard work."